Creative Universe and Ci2011 are proud to support Creativity Australia. Creativity Australia is a not-for-profit organisation that uses creative programs to enhance wellbeing, social inclusion, innovation and productivity for individuals, organisations and communities. 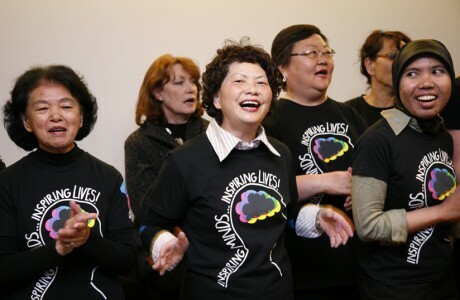 Creativity Australia’s acclaimed With One Voice choir social inclusion programs aim to recognise each unique voice. The program builds social capital and assists migrants, the unemployed, those with disabilities and disadvantage, and general citizens and workers seeking to unlock their creative potential and make a difference. The programs are multicultural, multi-faith, inter-generational and cross all areas of society… from asylum seekers to CEOs of organisations. The program helps to develop a sense of belonging, new networks, skills and employment pathways. Participants develop leadership potential, build self esteem, communication and creative skills. They also learn how to work as a team. When many diverse voices come together as “one voice” on a regular basis, the outcomes are transformational. Individual mentoring and networking is encouraged. The choirs rehearse weekly with a professional choir leader and share stories, challenges and dreams. Each choir performs regularly at conferences, concerts, festivals and special events. There are 11 programs currently operating in Victoria with another three commencing in 2011. Plans are underway for programs in other parts of Australia.